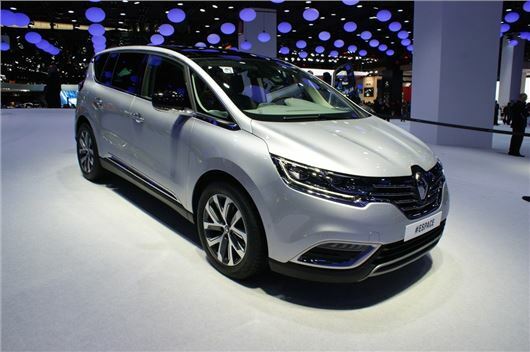 Renault has unveiled an all-new Espace at the 2014 Paris Motor Show. The latest version of the MPV isn't destined for the UK though, which is a shame given how good it looks. It retains the Espace virtues of being large, elegant and innovative. It's slightly bigger than the Ford Galaxy and Volkswagen Sharan and is very similar to the Espace concept car shown last September at the Frankfurt Motor Show. Like previous generations of the Espace, a model range that first appeared 30-years ago, it has a brightly-lit, comfortable, and occupant friendly cabin with 'floating console'. Both five-seat and seven-seat versions feature interior modularity and attention has been paid to detail with regard to the build quality according to Renault. My 13 year-old Mk 3 Grand Espace is superior to this monstrosity because it can comfortably accommodate 7 people plus luggage whereas this is basically a 5 seater with a couple of high chairs in the back. Pity that the modern trend for cars with big wheels but no space is driving out the more practical, less pretentious models of yesteryear.